I’ve been reading and reviewing a lot of new release books lately, but I also haven’t forgot about my 100 books challenge. 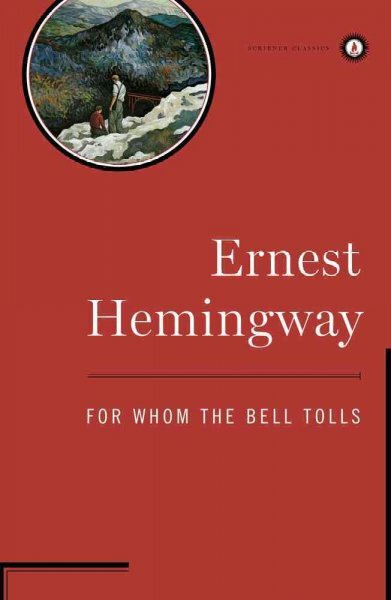 Yesterday I finished Ernest Hemingway’s 1940 novel For Whom The Bell Tolls. Set amidst the Spanish Civil War, this semi-autobiographical novel tells the story of Robert Jordan — an American Spanish language instructor and professional dynamiter. During the war against the fascists, Jordan has been assigned to work with a team of republican guerillas to blow up a bridge during an attack on the city of Segovia. Other notable characters include the ruthless guerilla leader Pablo, his strong-witted wife Pilar, the elderly guide Anselmo, the gypsy Primitivo and the young Maria. While reading this nearly-500-page novel, it is difficult to remember that the entirety of the story takes place over a four-day/three-night period. During this period, the band of guerillas grow exceptionally close and tensions escalate. Most notably to have taken place within such a short time period, Robert and Maria fall in love, share each other’s darkest secrets and pledge to be married. My husband read the book too, and it was interesting to have a discussion on what elements of the book were our favorites, as they were entirely different. He experienced the book as a war novel, and most enjoyed the explorations on political ideology, the anti-fascist and revolutionary discourse, and parallels between the Spanish revolution and American republicanism (with a small “r”). I, on the other hand, most enjoyed the love story between Robert and Maria — which my husband found to be annoying and detracting from the war story. But my favorite character was actually Pilar (aka “Pablo’s woman”) for her strength, wisdom and tell-it-like-it-is attitude. I feel I also cannot write a review on For Whom the Bell Tolls without making some reference to the language. Although it’s a twentieth century novel, it’s written in a very formal style whereby the characters speak in “thy” and “thou”. As the novel is based on Hemingway’s own experiences in the Spanish Civil War as a reporter with the North American Newspaper Alliance, and as he wrote part of the novel while living in Cuba, I wonder if he began drafting in Spanish and then literally translated it into English — using the formal “vosotros” tense rather than the informal “tu” tense. He also frequently uses words such as “molest” instead of “bother” (the Spanish for “bother” is the verb “molestar”) and routinely uses the words “obscenity” and “unprintable” in place of what he really means to write. This is my first real experience with Hemingway, aside from reading The Old Man and the Sea in 7th grade, so I am curious to see how I’ll enjoy his other books. Both A Farewell to Arms and The Sun Also Rises are on my 100 books challenge list, and now I’d like to read Green Hills of Africa too. This entry was posted in Book Challenge, Movie Reviews/Book Reviews and tagged book reviews, classic literature, Ernest Hemingway, fiction, literature, Spanish Civil War. Bookmark the permalink. I’m impressed that you’re revisiting Hemingway for the first time since 7th grade! I just can’t convince myself to do it. I’ve only read A Farewell to Arms (which I didn’t like) and A Clean, Well-Lighted Place (a short story I really liked), and it’s been about 15-16 years since then. Yeah, I actually had a reading from A Farewell to Arms at my wedding, without ever having read the book. I’ll have to check out some of Hemingway’s short stories eventually too. I loved this book! A very quick read is A Moveable Feast by Hemingway. If you send me your address I’ll send it up to you. You can read it in a couple hours and it really gives you a little glimpse into Hemingway’s life. It’s written when he was in Paris, great read. Thanks for the recommendation, Amber! I will e-mail you my address shortly.